Our adventure began when we got off the airport bus in downtown Paris and began walking to our hotel. I passed a sidewalk vendor selling fresh bunches of lily-of-the-valley and almost cried. These sweet and fragrant flowers don't grow in California or the mountains of Colorado and the scent took me back to my childhood in the Midwest. It was a magical moment and a true indicator of the good time we would have in Paris. 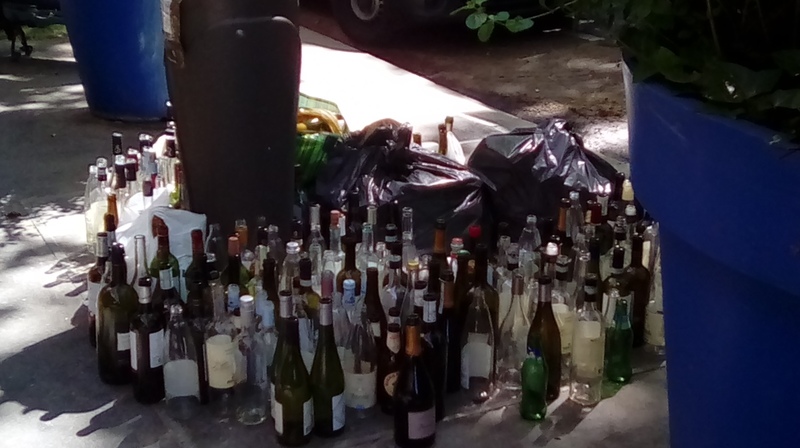 My partner and I went to Paris for 10 days in early May 2018 and were reminded to “bob and weave” and not become attached to the best-laid plans. The ideas that I hatched while working from my home office in Allenspark, Colo., didn’t always pan out. But most of them did. Actually, I went to Paris in part because it's close to London. I wanted to see several of my friends from England. It’s a comfortable day-trip on the Eurostar from London to Paris and I was able to catch up with Jamie, Leila, Anne (who came from Greece), and Tim (who flew from London). The one of our group who couldn’t make it due to the French rail strike was Maria who was closest -- traveling from southern France -- and was the most inconvenienced. A few days later, another Brit -- Jenny -- came over on the Eurostar. We also booked three day-trips by bus. Yes, those big monster tourist buses took us to Monet's garden in Giverny one afternoon, Mont St. Michel on another day, and to two lovely Loire Valley chateaux (Chambord and Chenonceau) on a third day. But visiting friends (2 days) and bus trips (3 days) used up half of our 10 days so in the end we didn’t set foot in any museums in the city. The weather was lovely, it was too nice to be inside. Mike and I had both been to Paris before, so we also gave ourselves permission not to visit sights like the Eiffel Tower, which we seemed to drive by several times a day. I wanted Mike, who is a foodie, to go on one of the secret food tours of Paris, specifically, “A Taste of Montmartre,” which got excellent reviews on line. And with good cause, it turned out. Mike was skeptical at first ("I don't need someone to tell me how to buy a piece of cheese") but I made the reservation and pushed him out the door. He found that his guide was a wealth of information not just about cheese, wine, chocolate, bread and meats but about the history of this fabulous city. It was well-worth the investment of time. We stayed in Hotel Langlois in the 9th Arr. -- which is the same hotel I’ve stayed in every time I’ve visited the city (this visit being my fourth). It’s charming, old-fashioned, not too big and within walking distance of the Roissy bus drop-off by the Opera. In the mornings, Mike liked to practice tai chi in a little park in front of the Trinite Church while I ate "escargot avec raisins" from our local pastry shop -- a round sweet roll studded with raisins. I also loved the fact that every restaurant or bistro offered a steak with bernaise sauce -- my favorite meal. The church bells woke us up in the morning and reminded us that mass was celebrated at both 7 a.m. and 7 p.m. We attended an evening mass at the Trinite 19th century Renaissance Revival church and felt more connected for it. But what, you may be thinking, were some of the plans that didn't work out so well? 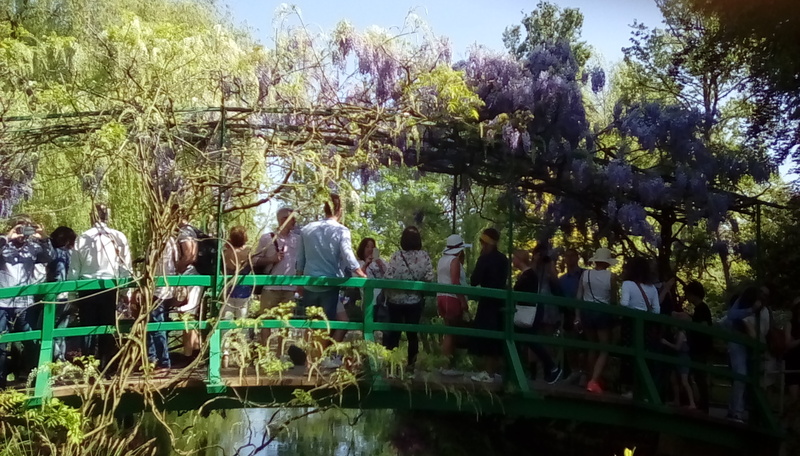 Take for instance the visit to Claude Monet's home and gardens in Giverny. The tour guides are pleasant and erudite and the buses are comfortable. But there's nothing they can do with the fact that the place was CRAWLING with people. It was way too crowded. We marched around the famous lily pond practically in lock-step with the people in front and back. Stopping to take a photo was dangerous. But here's the thing -- as soon as I got back home I ordered a copy of a Monet biography ("Mad Enchantment" by Ross King) and have been happily reliving my visit to Giverny -- minus the crowds. 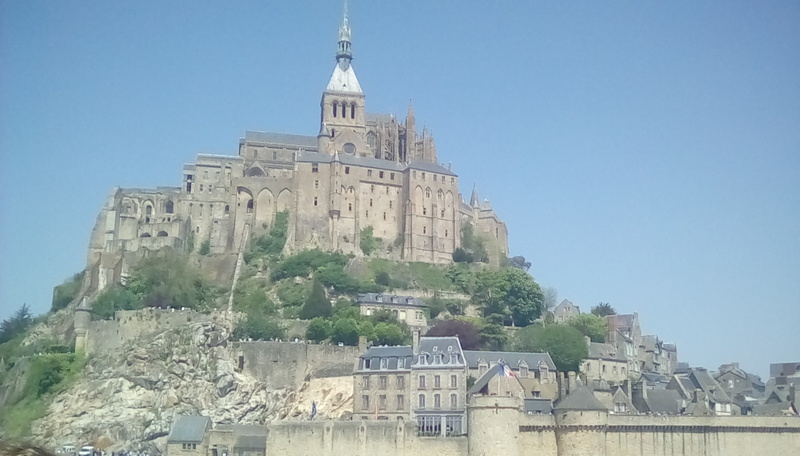 The same uncomfortable experience took place when we were whisked away by bus through Normandy to Mont St. Michel. The city on the ramparts was bathed in a misty light as we approached and it was just magical. But the walk up the town center to the abbey was again PACKED with people. I had last been there more than 50 years ago on a Grand Tour when my grandfather drove our VW bus to the base of the fortified island -- now you have to park a mile away and shuttle in. The abbey is described as a masterpiece of medieval architecture, which most people don't visit even though the single road through the village leads directly and steeply to it. The best way to experience the island, I think, is to stay in a local hotel overnight and enjoy the relative peace of the early morning and evenings without the day-trippers. We didn't have that luxury and it was still worth it. I thought we would run into some anti-American or anti-tourist sentiment and we did have to deal with one rude waitress and one rude waiter -- but whether that was a political issue or the problem of someone having a bad day I don't know. Most of the people were wonderfully friendly. We spent many hours just walking and talking to people we met along the way -- at the Shakespeare cafe next to the famous book store, on the Seine boat trip, in the parks. Mike also met an American couple in Paris on their honeymoon who were cramming as much as possible into a couple of days -- a food tour, a cemetery tour, a museum tour -- a quick trip to London and then back to Paris. Whew. We decided to take it easy and only do as much as we wanted to. And that's how I made the somewhat obvious discovery of how French people recognize tourists: We dress comfortably because we are doing a lot of walking. French women on their way to work wear extraordinary high-heeled boots, tight jeans, and close-fitting jackets. Young men wore tight pants, too-small suit jackets and several days' growth on their chins. Even the mannequins in store windows looked uncomfortable -- pelvises thrust out, heads thrown back -- not a chic look. I brought along some hand-made (by me) felt flower pins and gave them to people I liked: one of the bus drivers who was an exceptionally good navigator, the woman who served us breakfast at the hotel, an Australian woman we met on a tour, all my British friends. Just a gesture. I also feel compelled to add my voice to the people who write travel hacks or tips on how to pack and what to bring. 2. Buy paper undies. You can get them on line. They are inexpensive and save lot of washing. Wear them, then throw in the trash. 3. Bring along some clothes you like but wouldn't mind leaving behind. I did this to the delight of the housekeeper who took several blouses, a skirt and a pair of shoes. 4. We packed two small umbrellas since May is the rainiest month of the year in France but didn't need them -- the weather was fine. And the hotel had lots of spares. 5. Do bring a small pair of scissors --handy for cutting open packages of Bonne Maman cookies and for cutting tags off new clothing. 6. I love what I call "domestic photos." Why bother taking shots of the Eiffel Tower when you can just buy a post card? I took photos of the interior rooms of Monet's house at Giverny, which have become a few of my favorites. I asked for permission and took photos of French children and teens. 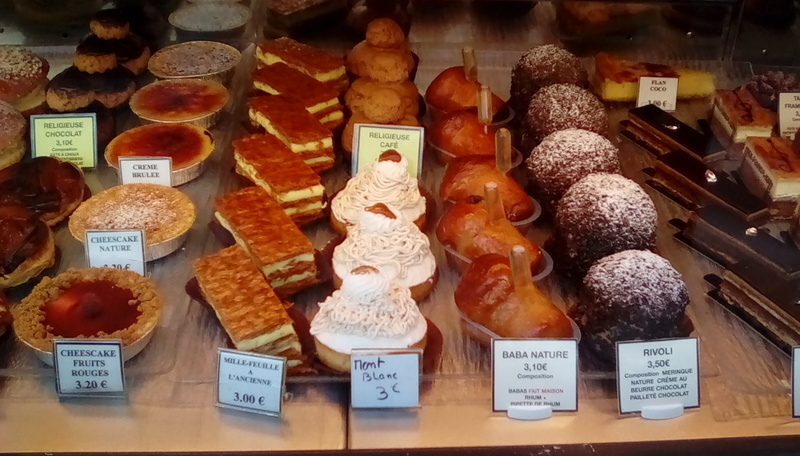 I love taking photos through the window of the patisseries. And if you are lucky enough to be staying in a room with a view, be sure to take a photo from that window. It will be one of your favorites when you get home. 1. "Mastering the Art of French Eating" by Ann Mah. 4. "C'est La Vie" by the late Suzy Gershman. Will we go back to Paris? Probably not. There are just too many places to visit and too little time. We are thinking a Greek island in 2019. Stay tuned. No links for this article.